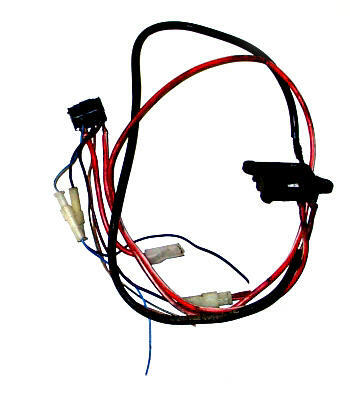 We recommend that you save your Suzuki stock wiring harness. Leave it in position in the engine bay to aid you in hooking up items as you go. After your finished with the diesel wiring, you can always go back and cut off unused plugs and wires or eliminate unnecessary wiring as desired. Acme conversions leave it all stock so that one can go back to the stock 1300 if one decides to do so for various reasons. 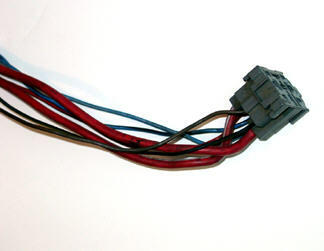 Other diesel wiring systems will work with your VW diesel engine conversion. Acme uses the VW Glow plug relay and harness because of economy. You can acquire a VW harness from a donor vehicle or you can purchase one from Acme. Get your donor vehicle glow plug relay wiring and strip off the unnecessary rubber grommets and extra wires so that it looks similar to, figure 1. Place the glow plug relay end of the wiring under the drivers side of the dash, figure 2. We use the left side space (from the steering column area to the door) and mount the relay on its base using a zip tie to attach to other main harness wires or brackets. It should be "easy access" should you ever need to replace the actual relay again. Run the fat red wire with the white stripe out the fire wall rubber plug to the glow plugs on your motor. Between the glow plugs and the fat red/white wire, you must install a fusible link of 55 to 80 amps. We use the stock VW fusible link and mount it on the engine bay fire wall just next to the rubber grommet that you feed the wire out of, figure 3. Run the other fat red wire to the battery positive cable. We run it under the dash to the passenger side and go out the rubber grommet next to the battery. Hook up the other wires from the relay to their corresponding connections using the wiring chart, figure 4. See notes under chart for additional wiring hints and for injector pump, glow plug temperature sensor and glow plug light. Figure 2, End of glow plug relay that goes under your dash. Connect to keyed power at the ignition. 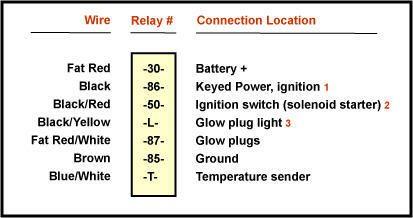 An easy location to use is the 15amp fused ignition on the lower left side of the fuse box. See outside fuse box cover for identification. Place a Jumper wire to one side of the fuse. Connect to the solenoid side of the ignition switch. A convenient place to connect is to tap into the Suzuki clutch switch wire(black/yellow)and solder. Connect one side of the glow light to the glow plug relay(Black/yellow wire from the "L" pin). 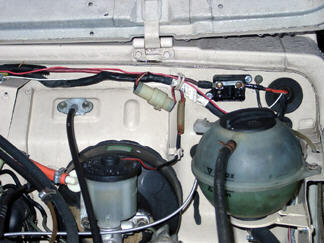 The remaining wire from the light gets connected to the stock Suzuki 15 amp switched ignition at the fuse box(same location as keyed power for relay pin #86). Note: If you don't hook the glow plug light up this way, the relay will not work correctly and you will not be able to start your diesel motor. Injector pump. Run a wire from the injector pump solenoid switch (on the injector) to switched ignition. The stock Suzuki coil wire (+) plug is a good connection point in the old harness. Glow plug relay temperature sensor wire ("T"pin, blue/white) goes to the back of the diesel head water outlet, along with the stock samurai temperature gage sending unit. Both screw in without modification.